Sorry I missed posting last week, but the hubs and I were in the Pacific Northwest with our daughter and son-in-law, and I am so happy with myself that I did NOT bring the laptop. I did not work at all except to post a few pix and insights on social media. But I do have some fun stuff to share with you today as a result of those five gorgeous days and it involves bookstores. I don’t think I know how to go on vacation without visiting the vacation spot’s bookstore or stores as the case may be. There are some exceptions. If I was camping, then there would be no bookstore visiting, but camping isn’t really a vacation! It’s an adventure, yes, but when you must cook your own food and do the dishes you are not truly on vacation. All that to say, I visited a couple bookstores while on vacay and I am here to brag on them today. 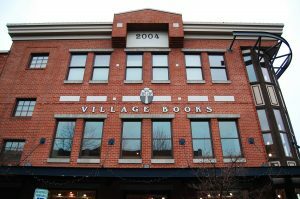 The first is McLeod’s Books in Vancouver, British Columbia, just over the border in Canada. I had read a few sentences about McLeod’s in a “Thirty-six Hours in Vancouver” piece in the New York Times a while back but I wasn’t prepared for its audacious awesomeness, nor the piles of books on the floor, in every corner, all the way to the ceiling – pretty much everywhere you looked. I’ve been in used bookstores before, but this one is the most stuffed. You need more than the 30 minutes we had to adequately peruse (the owner apologized that he’d a wedding to attend and had to close early) and perhaps not a detailed shopping list. Better to go into a place like that with just the expectation of finding a few unexpected delights. I wondered if the sales staff could know what they’ve got available in the store and then I found this article that allayed those concerns. Somehow they know! I wanted to take a picture or two but every view from my camera made the store look like a forgotten attic. I would’ve needed a wide angle lens (and perhaps permission?) but I found the one at left on Google Images and it’s a far better shot than I could’ve gotten. My daughter and I both eyed (at different minutes inside the store) a lovely boxed set of Jane Austen novels, and both of us wished we’d snagged it and are hoping it will still be there the next time one of us (surely it will be her before me) steps inside. 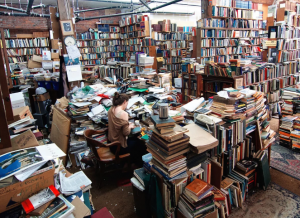 If you go, and you should, prepare your book-loving eyes for what might look like chaos but is really just a whole lot of books in a constrained space. 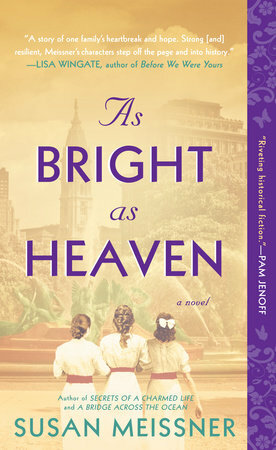 “This sweeping family saga encompasses seven generations of descendants of a Fante and his captured Asante house slave. After giving birth to a daughter, Maame manages to escape, making her way alone back to her own village. She is taken in by an Asante warrior, becomes his third wife, and has a second daughter by him. 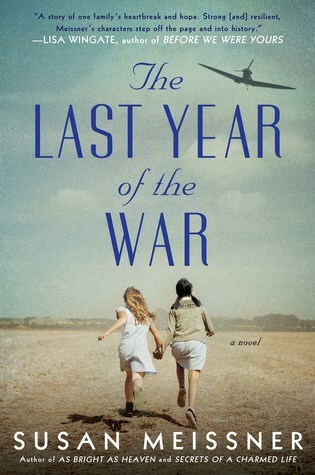 The two sisters, Effia and Esi, will never meet, their lives will follow very different paths, but their descendants will share a legacy of warfare and slavery. Effia will marry an Englishman who oversees the British interest in the Gold Coast slave trade. Esi will be captured by Fante warriors, traded to the Englishmen, and shipped to America to be sold into slavery. Progressing through 300 years of Ghanaian and American history, the narrative unfolds in a series of concise portraits of each sister’s progeny that capture pivotal moments in each individual’s life. 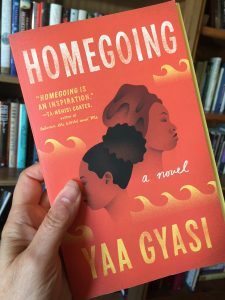 Every portrait reads like a short story unto itself, making this volume a good choice for harried teens, yet Gyasi imbues the work with a remarkably seamless feel. Through the combined historical perspectives of each descendant, the author reveals that racism is often rooted in tribalism, greed, and the lust for power. Many students will be surprised to discover that the enslavement of Africans was not just a white man’s crime.” I love books that span generations (have you read Pachinko? Loved it) so will be putting this one ahead of others on my TBR pile. 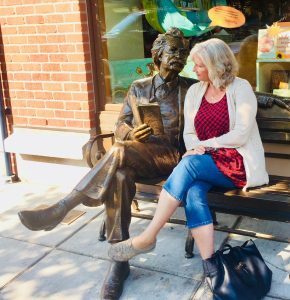 And just before I go, here’s a shot of me and Mark Twain (at right) on a bench just outside the Village Bookstore, right before we ate some Rocket doughnuts. It was a grand few days in the beauty of northern Washington and southern British Columbia and now it’s back to the workaday world, always made more exciting by the addition of new books! Would love to hear where your favorite bookstores are or if you’ve been to McLeod’s or the Village Bookstore.